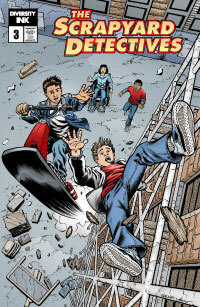 The Scrapyard Detectives is a free comic book series devoted to promoting the union and cooperation of young people from differing cultures. 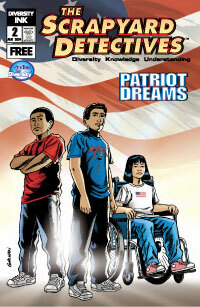 These educational comic books have proven successful in presenting an appreciation of multiculturalism, ethnicity, and diversity. Comic books are also an important developmental tool because they engage both the left and right brain to understand language and associate images. The Diversity Foundation is pleased to offer The Scrapyard Detectives as a free educational tool to libraries, educators, and community groups. To apply for printed issues of the comics for your school, library or community group click here to download the application form. These resource packets are used in conjunction with each issue of the Scrapyard Detectives comic books and graphic novel. These lesson plans and activities feature reading comprehension, vocabulary, and art exercises geared toward bringing out the most educational value of the Scrapyard Detectives comic books. The Diversity Foundation was fortunate to have the talent of Dr. Robyn A. Hill, PhD, in creating these packets. Robyn A. Hill, PhD, is an Associate Professor in the Teacher Education Department at National University in San Diego California. Since 2001, she has been involved with The Secret Origin of Good Readers project, speaking to teachers and librarians several times a year about using comics and graphic novels in the classroom and as tools for literacy. She also edited The Secret Origin of Good Readers Resource Book, which is available for free download. Due to the high quality and availability of The Scrapyard Detectives series, Dr. Hill enthusiastically created a special packet of worksheets, projects, and other resources that she hopes will help teachers to see how engaging comics and graphic novels can be for students of all ages. Dr. Hill can be reached at . The Scrapyard Detectives are on the case! 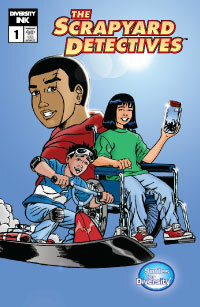 Join Robert, Jinn and Raymond as they solve the mysteries that affect their community, and learn valuable lessons about teamwork and diversity. 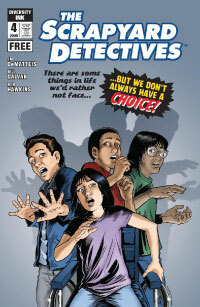 Collecting issues #1-3 of the ongoing all ages comic book series, this volume features three exciting stories. © 2016 The Diversity Foundation. All Rights Reserved.